Bishojo Senshi Sailor Moon THE 25th ANNIVERSARY MEMORIAL TRIBUTE is an album that was released on April 4th celebrating the 25th anniversary of the internationally beloved series. The artists who worked on the album have given their comments. The album is a follow up to the 2014 tribute album, THE 20th ANNIVERSARY MEMORIAL TRIBUTE, and features strong female representation. 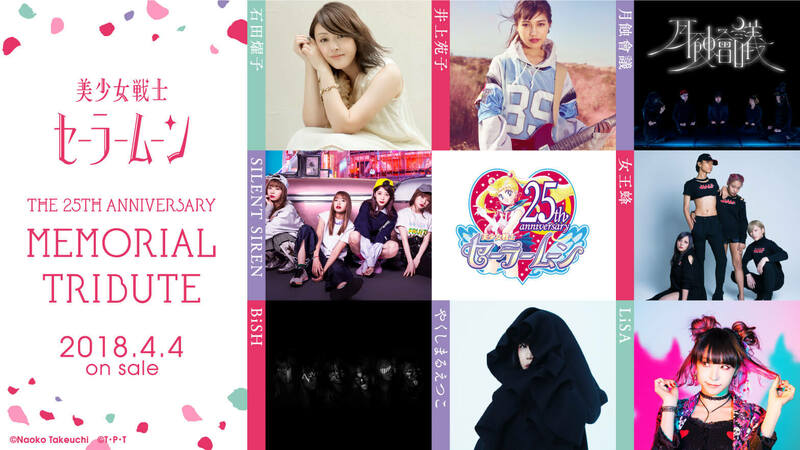 Artists included on the album have garnered much attention, with a line-up featuring Yoko Ishida, Sonoko Inoue, Gesshoku Kaigi, SILENT SIREN, Ziyoou-Vachi, BiSH, Etsuko Yakushimaru, and LiSA. See the full tracklist below. If you’re a Sailor Moon fan, then make sure you get to listen to this album. I’m LiSA, and I got to sing Moonlight Densetsu. It’s been 25 years since I first watched Sailor Moon, and now I’ve grown into an adult and have been given the opportunity to sing this song. This is for everyone that loves Sailor Moon. For everyone that loves music. I hope you look forward to it. Being given the chance to work on this tribute album made me remember doing nothing but hold onto my Gameboy handed down to me by father and playing Sailor Moon R while walking when I was younger. My favourite was Sailor Jupiter. She’s a very strong girl. When I think about it, she might have been the reason I look up to strong girls. As BiSH, I want us to be a strong group that can give that power to other girls, or someone. Since we sang Moon Revenge for this tribute, I want people to take power from this by feeling not just the cute side of Sailor Moon, but the dark side that also never fails to give up. 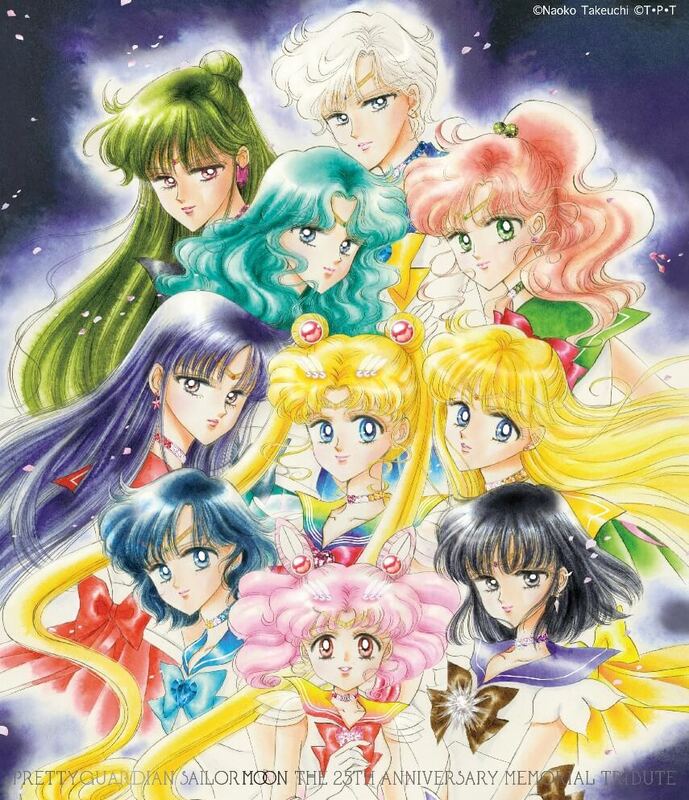 Congratulations on 25 years, Bishojo Senshi Sailor Moon. I personally have been influenced greatly by the series, and my work will continue to be. That’s why I’m overjoyed to be able to be involved with this tribute album. Although I’m an original singer, recording for this album felt fresh. But this wasn’t just a re-recorded self-cover of my debut song Otome no Policy. It digs deeper once more into myself back then. It goes back to basics, things like my innocence back in that time, and the feeling I felt when it was decided I would be a singer. The recording traces the steps of the me during that time. These aren’t simply covers. Please listen to this tribute world of Sailor Moon lots and lots, a collection of 25 years of great importance!!! Historically, a lot of revolutions have been realised and names have been made. But sometimes revolutions are made in secret. The countless revolutions not detailed in textbooks don’t take place at night, or during the day, and they can invite anyone. This song by the sailors can be anyone’s song. The revolution that Sailor Moon started will continue seeping through time. Let’s toast to the beginning of those 25 years, the miracle, and the future of these sailors. When you’re young and a girl, Sailor Moon has a special place in you and is someone you look up to at least once in your life, even now. You’d try on her outfit, copy her catchphrases. I’m so happy to be associated with this album that celebrates 25 years of that series. I covered “Rashiku” Ikimasho and was allowed to sing it in a way that’s like me. Being able to sing a song that so many people love makes me happy. I hope people enjoy the Sonoko Inoue version of “Rashiku” Ikimasho. Congratulations on 25 years, Sailor Moon! We’re honoured to be involved with a legendary tribute album. We were in charge of 2 songs and enjoyed approaching both of them in different ways. Kaze mo Sora mo Kitto… has a 90’s vibe to it while also feeling contemporary. For La Soldier, we bravely challenged ourselves to enhance the thrill and power of the original. We were also joyed for Akiko Kosaka coming into the studio. We had fun recording. We hope everyone listens to it lots. I’ve watched every season of Sailor Moon without fail. Even after becoming an adult I still watch the movies, collect merchandise, sing the songs at karaoke. My love for it hasn’t changed since I was younger. I never thought the day would come where we could cover a song together, no matter how many times I asked. I’m so, so happy! Our cover of Sailor Star Song maintains the greatness of the original but also has a SILENT SIREN touch to it! I was excited during the entire recording. I want to cherish and cherish this song. I want lots of people to listen to it. I want to continue working hard without forgetting my heart I place trust in and be strong and beautiful like the sailors.